The Bat-Safe LiPo Charging Case is a simple and effective solution for charging and storing LiPo batteries. If you have an R/C model, chances are you own at least one lithium battery. Lithium batteries are an integral component to surface and air models. In rare instances, lithium batteries can become hazardous and catch fire - destroying your personal items, your home and maybe even the life of you or a loved one. Thats why Bat-Safe was developed. Bat-Safe is an insulated and vented, steel, double wall steel box that contains the fire and intense heat in the event of a battery fire. The smoke and soot is filtered through a built in flame smothering filtration system to protect the area from odor and a majority of the smoke damage that can occur from a battery fire. 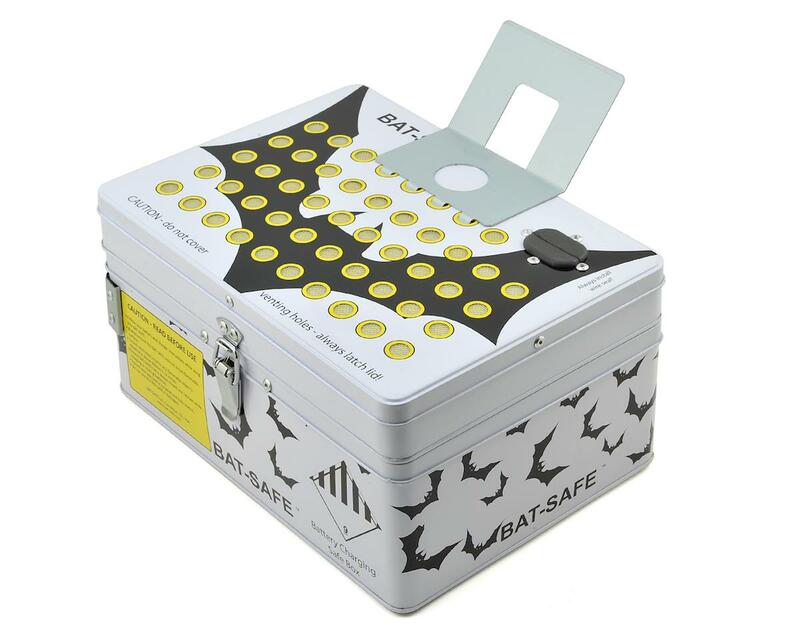 Plus, Bat-Safe is light weight, easy to use and most importantly, inexpensive! 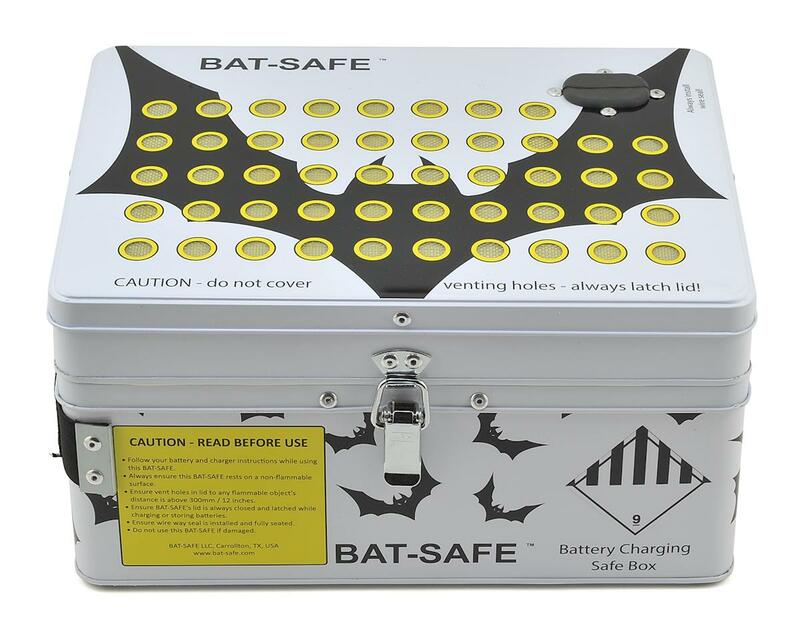 The Bat-Safe is cheap insurance for anyone who uses lithium batteries of any size. Other features include the ability to charge and store up to two 6S 5000mAh (222Wh) LiPo batteries safely, a charger stand to help keep your charging station organized and tidy, a handle for easy transportation, a fire proof lid seal, a wire through port that provides an access point for charging wires. All of these features combined make Bat-Safe the most advanced battery charging accessory that creates a safer charging environment than anything else currently available. I don't have a dog in this fight other than I have personal experience with this product (purchased through the Kickstarter campaign). To say that this is comparable to a metal box from the dollar store is simply an ignorant statement. It is actually a well engineered and manufactured product designed by an engineer (and RC pilot) who has professional experience in fire containment systems and who came up with the idea after experiencing a lipo fire personally. When used as intended it is designed and tested to actually contain a lipo fire and a majority of the hazardous byproducts that occur as a result. Yes, $60 is a lot more than a lipo bag but personally I do not believe that a lipo bag will mitigate a potential issue as effectively as this would taking into account not only the flame and heat but also the nasty and messy combustion byproducts. Also, Lipo bags last a few years whereas I expect the Bat-Safe would last pretty much forever. I use lipo bags for storage and am careful to store batteries at appropriate charge levels to minimize potential hazards but use the Bat-Safe when actually charging. There are two types of LiPo users - those who have seen a LiPo fire, and those who will see a LiPo fire. They arent pretty and will destroy anything they contact. Hopefully you dont have to deal with the damage first hand. If you search the Bat-Safe on youtube, you can see that it does in fact do everything they claim - it will contain the fire from batteries as large as 12S - 5000mah. Unlike a metal box, these are vented and will not blow up on you (like an ammo can), are insulated (so you can handle them while the battery is burning inside), and have a filter system (prevents the soot and odor emitted from a LiPo fire from damaging the room where the battery fire happens). 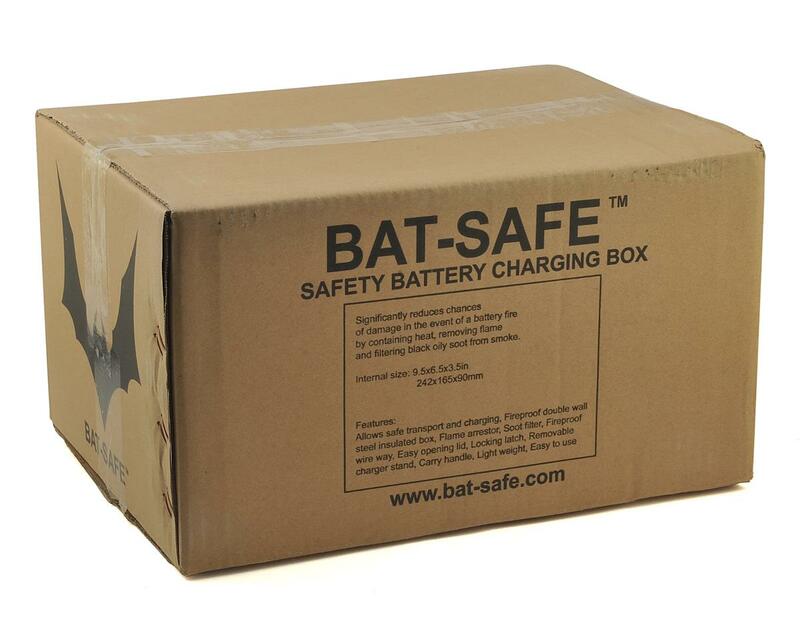 The Bat-Safe is cheap insurance to protect your home and valuables from the irreversible damage caused by a battery fire. And FYI - Kick starter prices were for those who believed in the product and were willing to jump on board early - like me. My only regret was not getting more! I need two more Bat-safes to store all my LiPos. 9 customers found this review helpful. 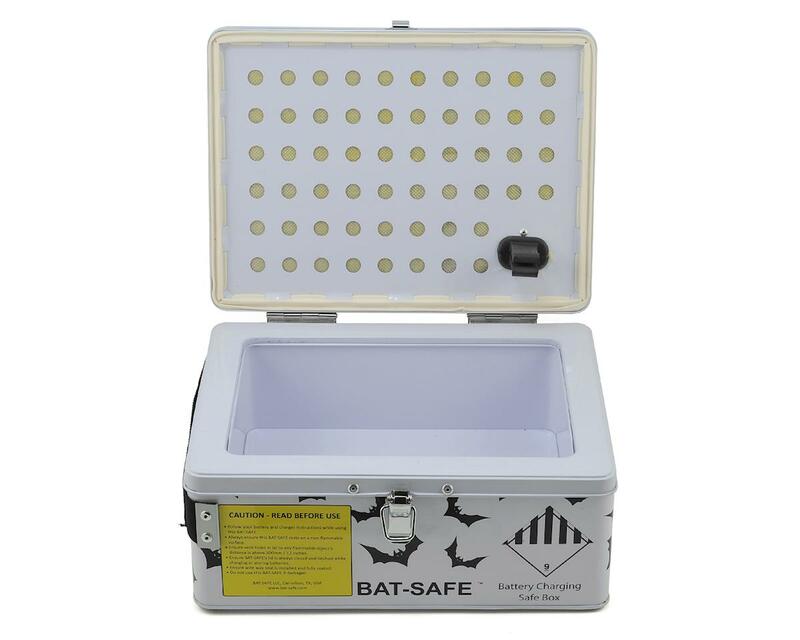 I purchased a bat safe after seeing it on amain's main page. I had never heard of the item before but was curious about it. I thought $60 seemed a little high but bought one anyway. After receiving it I feel the price point is valid. It's a double walled metal box with insulation between the walls and lid. It has a fiberglass seal like a wood burning stove. I hope I don't have to see if it does what it claims but I can recommend it to anyone that wants peace of mind storing their lipos. It is also much larger than I expected. My only criticism is the paint scheme takes away from the products quality. I hope this helps anyone on the fence with this product. I like the idea of this product, and I don’t mind the price for what it does. However, there doesn’t seem to be any quality in their manufacturering. I received my first one and the lid was out of alignment and one bracket was pulled away from the case. Amain swapped it out, but the second one had the same issue. At that point 3 weeks passed, Amain said I could send it back again, but the hassle and additional 2 weeks it would take to get another one wasn’t worth it to me. Hopefully if I ever have a fire the case will contain it, I say that because of the seal on the lid doesn’t look good from being out of alignment. Maybe I am being picky, but when manufacturers pack items up like that it’s hard to trust their products. I am just saying, think about it! Also, I sent a message to the manufacturer 7 days ago and have not heard anything. What's with all the hate about the price? If you don't have $60 to buy something nice then just keep your mouth shut. This is a very nice piece of protection and it's a lot more than just a cheap metal box. This manufacturer has produced something that could save someones house from burning down. That $60 doesn't seem like much to pay for this level of insurance. Perfect investment for the money, industrial standard. I like the product. Use to charge two batteries in parallel at the same time of 5000mah 3s for my e-Revo. Also, I leave other batteries stocked inside this box when I'm not using it. The safe has a good finish and gives me security. Thank God I have not used it for its final purpose but I believe it to be like an Air Bag, it is good to have and to use. Unfortunately the product is out of stock why not buy again. The only thing missing for him to be perfect is a system that holds the lid open, like the hood of a car ... Anyway, I recommend yes! You guys whining about it cost to much and an ammo box is fine should go here. I don't know about you but my house is worth more than $60. Created by Tom Mast from Texas was selling for 40 bucks on Kickstarter. 1 of 13 customers found this review helpful. You can just use an ammo can and drill holes in it. 0 of 20 customers found this review helpful. 1 of 23 customers found this review helpful.